Designers like to talk about “solving design problems” but is that their most valuable activity? And is it really best to “define the problem” as a first step? Problem-solving is an activity that drains people’s energy. This is not news. In the late 1960s, Ronald Lippitt at the University of Michigan found that when groups begin a major planning exercise by focusing on problems, they get depressed. By contrast, Lippitt also found that when groups begin by developing a specific and persuasive definition of their future, they had more energy and motivation to work through problems along the way. Problem solving tends to be about filling gaps and fixing deficiencies. Fixing large scale problems can feel overwhelming, maybe even impossible. The best planning process begins with vivid aspirational statements, rather than setting out to solve a problem. We can compare Abraham Maslow, who was a leader in the positive psychology movement (along with Martin Seligman) to Aaron Antonovsky, who studied positive health (which he termed salutogenesis) rather than sickness, and Ronald Lippitt (originally with Kurt Lewin) who led a “preferred future” approach to planning (v. problem solving). For all three of these pioneers, the idea of focusing on positive concepts rather than pathology is not merely about “positive thinking.” Pure positive thinking is vulnerable to ignoring blind spots while oversimplifying challenges, which can lead to bad decisions. Instead, we can plan for greater possibilities using rigorous values-based criteria to guide our decisions. Planning for possibilities begins by identifying assets rather than deficiencies, and goes on to define a purpose, as well as values and aspirations. This planning approach leads to better decisions than the most creative problem solving model. 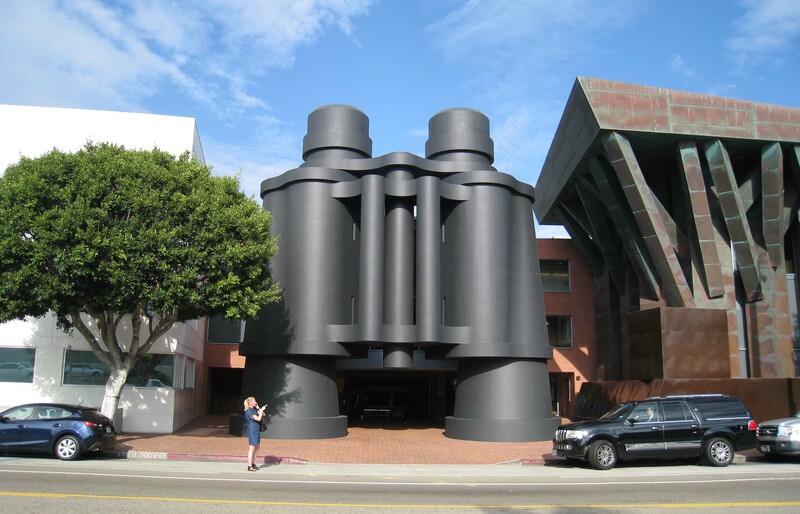 photo: Binocular’s Building, Frank Gehry’s design for Chiat/Day in Venice, California, 1985-91. Designer who explores how design thinking can humanize everyday work situations.